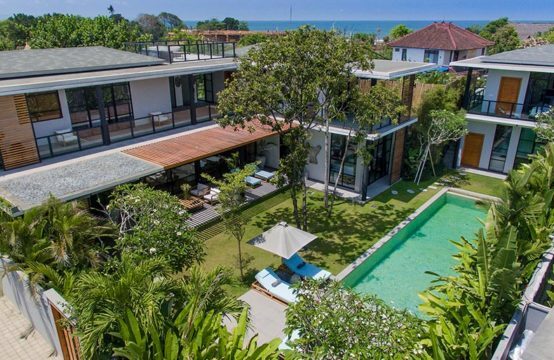 Villa Joss is perfectly situated 100 metres from Batubelig Beach in Greater Seminyak, 30 minutes from the airport and minutes from the boutiques, restaurants and nightlife that make Seminyak so appealing, the elegant Villa Joss embraces all the comforts and glamour of modern tropical living while preserving an exotic atmosphere and distinctive Balinese charm. Designed by one of Bali’s premier architects, the quality of the design and craftsmanship is evident throughout this four-bedroom villa, making ample use of leather, recycled teak and other beautiful organic materials, as well as a remarkable collection of fine art and Majapahit period stone carvings, to capture the style and spirit of Bali. 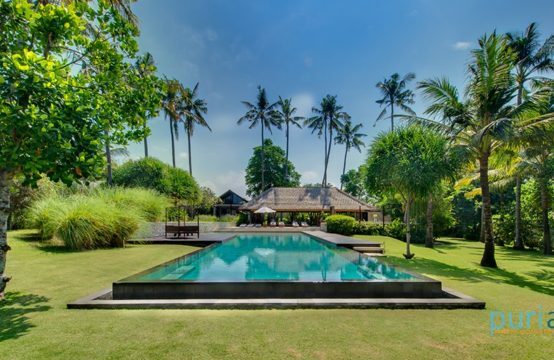 Completed in August 2010, the contemporary Balinese architecture of Villa Joss features a living room and dining room pavilion, a four bedroom pavilion, an entertainment room and business centre, and an open air ‘bale’ lounge pavilion in the spacious gardens with a 16-metre swimming pool and outdoor Jacuzzi. The fine art traditions of Bali have been highlighted with care in Villa Joss. Upon entering the main gate, guests are greeted by a stone relief carving of Balinese Gamelan musicians which dates back to the Majapahit Kingdom’s retreat from Java to Bali in the 1500’s. The original carving is found in one of Bali’s oldest temples, Pura Dalem in Desa Singepadu Tengah, and was reproduced at Villa Joss by a family of artisans from Batu Bulan, the most famous stone-carving village in Bali. The gorgeous entrance to Villa Joss involves a covered walkway bordered by lotus ponds with Koi fish; all draped in a hanging garden of green vines leading up to a serene seated stone Buddha set against a cascading waterfall. The bedrooms and living spaces of the 4 bedroom Villa Joss showcase beautiful fine art paintings and limited-edition litho prints by some of Indonesia’s best-known artists. Each bathroom features a stone relief carving detailing different aspects of the main temple carving inside the main gate. The walled garden and graceful interiors offer an abundance of space, natural light and separate places to relax. Children can enjoy a BOSE surround sound movie on the 48″ flat screen TV in the entertainment pavilion while one group of adults enjoy some reading in the living room, and another group of adults lounge, surf the internet or watch sports on the 45″ flat screen TV in the garden ‘bale’. The pool deck is punctuated with big pots of flowering lotus. The interiors of the villa have been lovingly furnished, accented with colour and completed with delightful attention to detail. The owners have made every effort to employ ‘Green Friendly’ technologies in the construction of Villa Joss including low energy lighting and a combination of solar and low energy convection water heating systems. Similarly, with the exception of certain high end imported fittings and equipment that were not available in Indonesia, every effort was made to use local materials and craftsmen. All furniture was locally made in Bali and Java. *Please note the above rates are valid until 31 Mar 2019. Please email us if you would like to make a booking after this date.